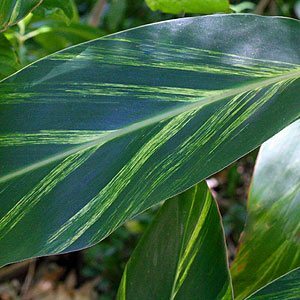 Alpinia zerumbet or ‘Shell Ginger’ also known as the Pink porcelain Lily is a wonderful tropical to sub tropical plant and the variegated variety has colourful foliage as well. And if you live down south then you are in luck as some ‘Shell Ginger’ species are fairly cold tolerant and could be grown in a frost free position as far south as Melbourne. It will not flower as prolifically in the colder months as it does in warmer climates but it will be star in the garden in spring and summer. 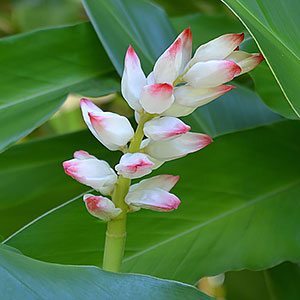 Alpinia zerumbet cv. Variegata (foliage pictured right) is the popular one at the moment, green foliage with cream and yellow variegation and creamy white and pink fragrant flowers that hang in clusters. Reaching a height of around 90cm in most gardens Alpinia zerumbet can get to twice this in good conditions. Usually sold online as rhizomes in winter Shell Gingers are best given a little tender loving care until established. Plant is a container to start with, usually the first year is adequate, this gives the rhizome a chance to grow a good root system in a confined space, which it seems to like. Make sure that the new shoots are just showing through the soil. Depending on your location full sun to part shade, the warmer the climate the more shade. However in southern states remember that very hot afternoon sun in summer needs to be avoided. A humus rich moist deep soil is best and when you are replanting those new shoots should be at ground level. Once acclimatised and established fertilise you shell ginger with a diluted liquid fertiliser every 2 weeks. Keep moist so some humidity is available, especially in southern Australian summers. Can you grow them indoors ? Probably not the best house plant, however with the right humidity and a well drained but moist potting mix you can. Avoid hot sun through glass as this can burn foliage. Alpina are members of the ginger family, (zingiberaceae) A. purpurata is known as the Red Ginger. A. zerumbet, A. formosana and A. malaccanse are all worth seeking.